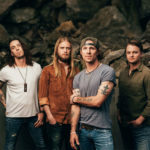 Blackjack Billy is bonded together by music — specifically, by the no-holds-barred, good-time, party-down rockin’ country that is endearing them to fans internationally. The group first impacted in 2013, when they independently released their first single, “The Booze Cruise,” to digital media. With minimal promotion, the summertime anthem nonetheless won frequent rotation by SiriusXM’s “The Highway,” achieved Platinum certification in Canada, charted #1 in Australia, and became the hottest-selling iTunes song in America by any act without a label deal that year. Raised in Kennett, Missouri, (also home to Sheryl Crow, Trent Tomlinson and David Nail), lead singer Noll Billings hightailed to Hawaii after high school and then to the Caribbean before hanging up his surfboard and settling in St. Louis. He built a local following through local club gigs and eventually left for Nashville to score a publishing deal with EMI and pursue bigger dreams. Jeff met Noll through their mutual publisher, EMI, and the impact was immediate. “I had written with a lot of people over the years, and the first time I sat down to write with Noll we completely connected. I basically just wanted to write everything with him after that.” With that, Blackjack Billy was born. They bought a converted airport shuttle bus, booked some shows and hit the road. “We bought a converted airport shuttle bus, booked some shows and hit the road,” Jeff says. Newcomers Weston Jordan (drums) and Clayton Shay (guitar) round out the band.